An article on the Press Gazette‘s website today reported on the Daily Mail‘s criticism of the BBC, after the corporation admitted using private detectives at the Leveson Inquiry. 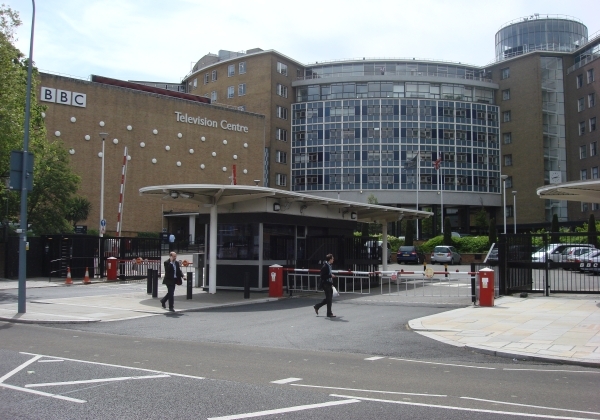 BBC (British Broadcasting Corporation) Centre, London (Photo by Panhard). To me this is a rather foolish route to take, as not only does it reek of hypocrisy, it also does nothing to help journalism as a whole. While obviously newspapers and broadcasters shouldn’t shy away from reporting about Leveson, because that would only breed more distrust in the industry, to resort to ‘infighting’ via editorials seems a bit cannibalistic and self-destructive. It’s now clear to all that virtually every news organisation has turned to underhand tactics at one time or another, but to continue dragging them up and mudslinging won’t help us move forward. It will only do the opposite and hold us back. Clearly the Daily Mail’s agenda against the BBC comes into this issue as well, and the fact the BBC used licence fee payers’ money on PIs adds a different angle too, but continued attacks will only damage journalism’s integrity. This is a time when news organistions should be speaking to one another to try to move the industry forward, not just squabbling about who’s to blame. Excuse me, but is there a Royal Wedding this month? I was just curious, because there doesn’t seem to be much coverage of it. That is apart from the small amount of coverage which has been given by every national newspaper, every day since it was announced! Today, believe it or not, is no exception. 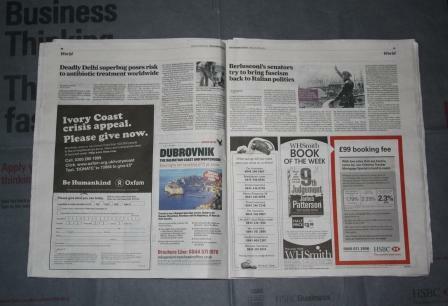 Look at the front-pages of the Daily Telegraph, the Daily Mail, the Daily Express and the Daily Mirror. Kate Middleton is on each one. Four of the eight main national papers have gone with her picture. Why? They aren’t even good pictures, or at least nothing special. I know, as we all do, that when there’s a dead horse (which this story is) you flog it for all it’s worth. But come on, this is bloody ridiculous. 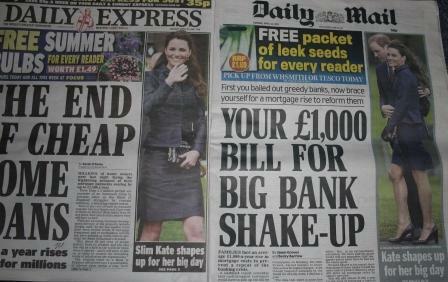 The Mail and Express have even used the same “Kate shapes up for her big day” line. 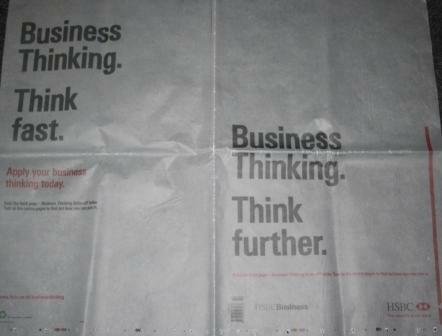 I know they’re practically the same paper, but try an inject some originality at least. I am one of the few people who, it seems, is actually looking forward to seeing the event, especially as it seldom happens. But, I think we’re all tiring of this blanket coverage of every minor thing Will and Kate do. Please papers, give it a rest, at least for a day or two. 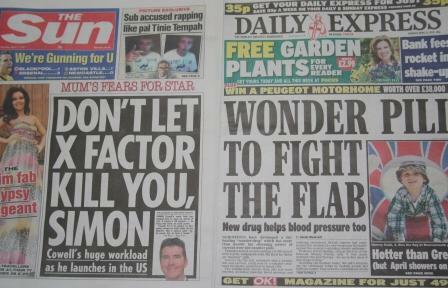 Hurrah, it’s good news for fat people, at least according to the front-page of The Daily Express. Their splash is about a “wonder pill” which has “more than double the slimming power” of current drugs. Sadly, as we all know, stories like this have come and gone before. Will this “new weapon in the battle against the country’s spiralling obesity epidemic” (wonderfully powerful language) work? Page four of The Times today has a funny story about Boris Johnson getting up to his old tricks. The Mayor of London has asked the “entire newspaper industry” to come clear about its use of phone hacking and similar methods. Frankly, this is a pretty ridiculous suggestion, for two reasons. Firstly, no newspaper in their right mind would confess to such tactics unless they absolutely had to. Secondly, if they all did, then the amount of cases which would come to light would be staggering. The most sympathetic (or just pathetic, depending on how you see it) story of the day has to be The Sun’s front-page. Now, not only is this completely unsubstantiated (the quote comes from a “source”) but even if it was true, it’s quite hard to believe. It’s not as if he’s chasing criminals or working long shifts on a hospital ward. He’s presenting TV shows. That’s not exactly stressful. Even if it was, I’m sure he’s got enough cash to keep himself in good health. How do you solve a problem like the BBC? The organisation has, over the years, gone from strength to strength and given us lots of great things. But, for all the good it does, and all the new ground it’s broken since being created, there are times when it deserves criticism. Take this weekend’s Grand National for example. The main event in the horseracing calendar is a world famous occasion. Yet Saturday’s was marred by the death of two horses. This was obviously a tragedy, which needed covering. Yet the BBC shied away from doing so. Rightly, it received criticism for that. It may not have seen it as being a very sensitive or politically correct thing to do during the showcase event, but even so, an organisation like the BBC should have covered it in more detail. It’s times like that which do the broadcaster no favours and give ammunition to critics. Yet for all the damage it does itself, there are moments of genius. Take a programme which I watched yesterday, called ‘The Truth about Lions’ (catch on iplayer if you missed it). It chronicled the rise and fall of the animal in Africa, and was another in a long line of high quality wildlife shows which has been produced by the beeb. So, what deserves more notice? The times when it makes mistakes, or the times when it blows us away? It’s a hard one to decide, made more complicated by the fact that we, as viewers, pay the licence fee. Sadly, it’s an issue which could be discussed in a lot more detail than I can go into here. But what do you think? Should be more critical of the organisation? Or should we let it be?